★ Halloween specials - 50% OFF! ★ Enhanced for iPhone 5 and support 4 inch display! Add incredible realistic horror effects to any photo and make them awesome. You’ve never seen anything like this! This is the perfect app for you! Effect using horror filters such as blood, ghost shadow, smoke, fire or many others. 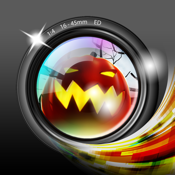 Add more graphics with huge selection of horror stickers or text for more realistic scary pictures. When you are done you can share your scary picture via email, on Twitter or many others. ★ Add scary stickers or text.